CHANDIGARH/BARWALA: The Haryana Police on Wednesday confirmed that five women and a child have died during the stand-off between controversial sect leader Rampal and security forces. NAIR SUVA: Reaching out to 14 Pacific Island nations, Prime Minister Narendra Modi today announced setting up of a $1-million fund and visa-on-arrival facility for them. HYDERABAD: An AK-47 rifle- wielding man allegedly tried to abduct Aurobindo Pharma's Director K. Nityananda Reddy from his car near a park and opened fire when Reddy and his brother resisted in the posh Banjara Hills this morning. Washington: A massive early season snowstorm has pounded the Buffalo city area in western New York state, dumping record snowfalls, trapping people in cars and homes and killing four people, US authorities said. COLOMBO: Five Indian fishermen sentenced to death in Sri Lanka for alleged drug trafficking were released today after President Mahinda Rajapaksa commuted their death penalty. NEW DELHI: A day after the first Ebola case was reported in India, Health Minister JP Nadda today said arrangements similar to the one at Delhi airport, which helped detect the virus in a man returning from Liberia, have been put in place at 24 airports and stressed the situation was under "complete control". A fierce battle broke out between the Haryana Police and followers of Kabirpanthi Sect head Rampal as the police launched an operation to arrest the �godman� facing murder charge at Satlok Ashram, near Barwala, today. 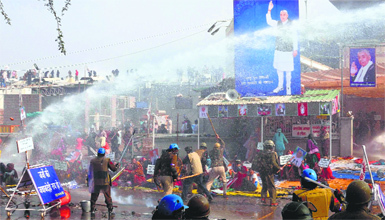 The WAR zone: The police clash with Rampal�s supporters outside Satlok Ashram at Barwala, Hisar, on Tuesday. A Tribune photograph. As injured ashram followers and policemen were wheeled into various hospitals in Hisar district, they blamed each other for the violent clash. 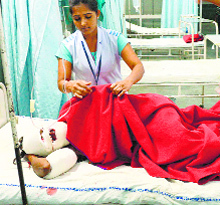 The Hisar Civil Hospital authorities had set aside 150 beds to accommodate the injured. The �inexperienced� Manohar Lal Khattar-headed BJP government in Haryana today faced its first challenge and fared �poorly�, as the Opposition put it. The Chief Minister chose to keep mum on �Operation Rampal� in Hisar�s Barwala, leaving the onus to defend government on the state bureaucracy. 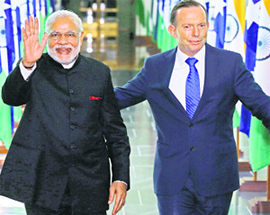 India and Australia today agreed on a landmark framework for security cooperation across the spectrum in defence, cyber and maritime security and combating terrorism, including the threats posed by foreign fighters joining extremists groups. Less than two months after they were elevated, three Judges of the Punjab and Haryana High Court have been transferred, leaving the legal fraternity astounded. None of the transferred Judges have kith and kin practicing in the high court; and the reason for their relocation has not been made apparent to the lawyers, leading to the demand for a more transparent transfer policy.